Yes, the 777s have air vents above the center seats. It appears that ship N865DA (B777-200ER) is the next aircraft to get converted, It flew MSP-NRT today and probably onto SIN very soon. One would then assume that ship N866DA is ready to RTS (return to service) - basically a swap. So, DL is moving along at a nice pace. Not quite sure why there is a lull in getting the LR's done - guess there is no pressure into finishing them. Looks like you're right on 7006 as it's on ferry flights to SIN. Re the 77Ls, FWIW, there's commonly some lag between the completion of the first aircraft to the second in a new mod due to STC and ironing out any issues. I hope they never make this mistake again. 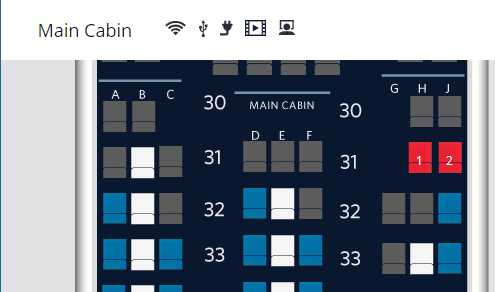 I will actively book away from the A350 in J if I can't get an aisle row. I do wish that DL would put the J gaspers in the side of the actual seats so that they are easy to reach, like VS J. Looks like N866DA comes out of mods tomorrow and is planned to operate DL 120 HND-MSP on Nov 27. Next for mods appears to be N862DA which is currently in MSP and would be ready as an equipment swap for the Nov 26 27 DL 121 MSP-HND if N866DA is indeed ready tomorrow. DL doesn't mean it as a devaluation. Proper international premium economy is very popular and is becoming standard offering in the industry. It's a quite reasonable decision DL has made. I get that none of that actually helps you and your decision to look elsewhere is quite reasonable too. Yes, agreed. Also, and sorry for being blunt, but I would guess that DM's who are flying international coach are not the customers DL is worried about loosing. And remember that there are still preferred seats and exit rows. Strongly disagree. A US based DM is spending a minimum of $15k, doesn't matter what class they sit in, I don't think Delta wants that money to walk out the door -- that's not a once a year flyer complaining in a vacuum. Some of us have corporate policies that require Y but that doesn't mean the fares are cheap. However Bastian has suggested that C+ is eventually coming back the 777 and the A330-neos will presumably have it so I would think it's only a matter of time before they come back to the A350 so that the entire fleet has it again. It's the logical move from a company that positions (and mostly delivers) itself as the airline for the business travelers whatever class you are traveling in. This is my situation. I can only book Y, and there's no way in hell I'm paying 90% more out of pocket for a PS seat. If revenue management wasn't so tough on releasing D1 GUC space in advance, it wouldn't be an issue. The thing is... I'm going to spend air travel $$ each year, and a lot of it. I realize each persons situation is different. Gambling with sitting in regular Y for 12 hours is not something I am interested in doing. Sorry to turn this into a Delta rant! Ship #7007, N866DA, has finished mods and is currently ferrying from SIN>HND, and will then operate as DL120 from HND>MSP later on Tuesday afternoon. Ship #7003 , N862DA, will replace it and arrive at SIN late Wednesday/earlyThursday. Anyone know what N707DN is doing in Amarillo (AMA)? Wikipedia says lots of aircraft painting goes on there but the frame has been there for a week and a half now. When they'll add it is unclear. I did read a summer interview with Bastian that left room for Delta to have a four-class (three-and-a-half class?) aircraft, and one article about the new A339 add-on order also suggests it will ship new with J/W/Y+/Y. In the interim, as a PM, I do agree that not having an option similar to instant C+ on these current PS equipped aircraft is a devaluation. The very limited exit row availability will get more fierce to grab.